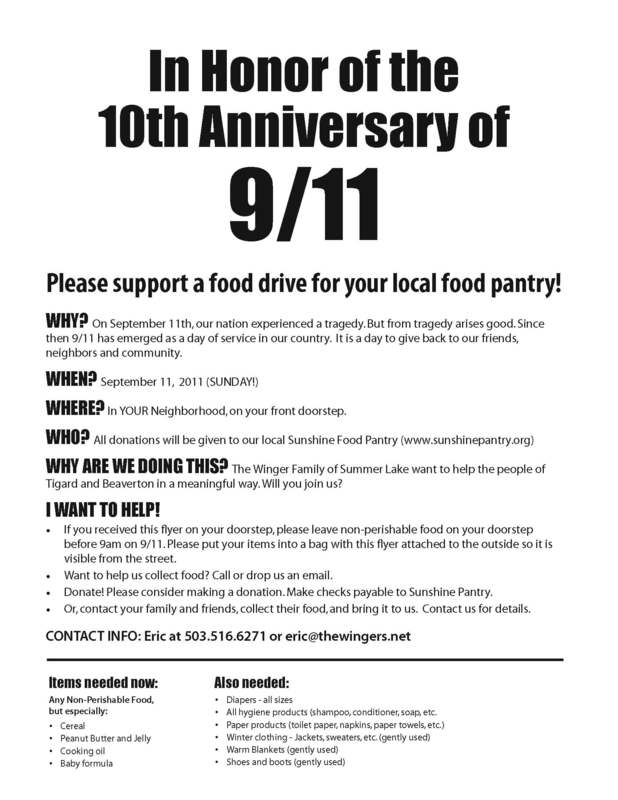 (Please consider supporting the Sunshine Food Pantry as part of the national 9/11 Day of Service and Remembrance). Ten years ago a tragedy befell all of us. Something that touched the lives of everyone around the world. Something terrible, never to be forgotten. In the years that followed, a new notion of what 9/11 meant arose. A notion of service and of community. The 9/11 Day of Service And Remembrance was established. Many other groups like 911day.org also sprung up. All with the goal of turning a tragedy into service. Whether it is to support our country, remember the victims of that awful day, or to fill a need in our communities, please consider giving something back tomorrow. Today, my family and I passed out almost four hundred fliers in our neighborhood. Tomorrow morning we will canvas those city blocks looking for donations from our neighbors. Then Monday morning we will take those donations, many or few, to the Sunshine Food Pantry so that those who are struggling to put food on the table can share in what we have. Below is our flyer. Please consider a contribution, an action, or a kindness tomorrow as a way to remember. Add your voice to chorus of those who look back, and yet look forward. This entry was posted in In the community, In the Neighborhood and tagged 9/11, day of service, Helping Out, Hunger, Making A Difference, Sunshine Food Pantry, Volunteering. Bookmark the permalink.